Hotel Vasundhara is a budget low cost hotel in Haridwar, which offers both AC and Air Cooled Rooms to provide comfortable stay. The has become the pioneer in the hotel industry in Hardwar. Beautifully decorated Reception and spacious Lobby with a fine synthesis of style and grace giving a feel of quite and calm atmosphere. Hotel Vasundhara has been promoted by Sh. Radhey Mohan Sharma, and his son Abhishek Sharma, a businessman and hotelier of repute, having a strong industrial liaison with top corporate houses. 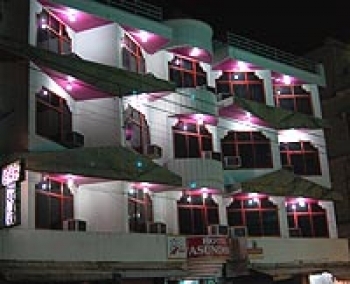 Vasundhara hotel is located in the heart of the Haridwar city, opposite to Mansa Devi ropeway. It is just 1 km from the railway station and the bus stand. It is also just half a kilometer from the famous Har Ki Pauri. The hotel Vasundhara has got 24 luxurious rooms including 11 A/c rooms, 10 Air Cooled rooms and 3 standard rooms. It has also got a dormitory with six beds with common bathroom for drivers. The rooms are beautifully decorated and elegantly furnished. All bedrooms are flooded with natural light, some with the added advantage of private balconies. 24 hour room service is, naturally, available. The beds provided in the rooms are tastefully decorated and the cleanliness of the same is specially taken care off with fresh bedsheets and fresh pillows. There is multi cuisine restaurant in Hotel Vasundhara, which provides delicious, and the choice is from among North and South Indian, and Oriental and delicacies.